Its been one evening which every Indian cricket lover waiting desperately and finally it arrived, when Team India dethroned Aussies from the Cricket World Cup and ended their 12 years regime. Team India also broke Aussie arrogance. It was India who started process of diminishing Aussie regime from 2001 with turnaround in that Eden Garden test match and from that series onwards Australian cricket started declining and yesterday India put final nail in the coffin. India moved to semi-finals where they will play Pakistan, indeed a mouth-watering contest in prospect and Australia already left for the home where Ponting & Co. have to face lot criticism. Its end of an era in Australian Cricket. Dhoni once again remained unlucky with the toss yesterday and Australia decided to bat first after winning the toss on a wicket which had something in it for the spinners. I think India did everything right except winning the toss. They fielded like leopards and I have not seen such a brilliant fielding in long time from Indian side. It was really heartening to see. It was good to see Dhoni attacked the batsmen and he reaped the fruits of attacking, by picking up wickets at regular interval which jolted Australian batting. Yuvraj Singh has found sublime form in this World Cup with the bat and ball. Indian bowling was also terrific but it became more terrific because fielders supported the bowlers however Munaf Patel was disappointing. Ashwin is the unsung hero of this team so far, he bowled brilliantly in whatever opportunities he got. Indian batting also delivered as Tendulkar, Gambhir and Yuvraj got half-centuries under their belt. Raina also re-discovered himself in this match by playing a small cameo. It was big call from Dhoni to drop Yusuf and replace him with Raina. It could have backfired but to Dhoni's credit it worked and its good for Team India that they found their proper playing eleven before semi-final.However there are areas of concern as well for India. Running between the wickets looked ordinary. Bowling of Munaf Patel was not upto the mark. Throwing of wickets by batsmen after settling in, Dhoni's poor form with the bat.etc. and Indian team have to sort out these problems before semis. Overall good performance by Team India and they will go to Mohali with lot of confidence, where they will take on arch-rivals Pakistan on next Wednedsay. 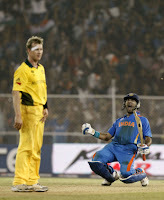 For Australia, everything went wrong in this match except Ponting's century. This Australian side was not the same which we watched over the years. It had the same old aggressive attitude but quality was completely missing. If we talk about averages of the batsmen, then most of the batsmen averages in mid-thirties which clearly indicates the quality. They were dependent heavily on rejuvenated Brett Lee in this tournament but one bowler can't win you matches and that bowler can also have off-day, so needed 3 to4 quality bowlers to win the game. They did alright by reaching the score of 260 which was par score under the conditions prevailed but they did not had the bowlers who take advantage of the conditions. They clearly missed two quality spinners on a wicket which had something in it especially for the spinners. Krezja was the only spinner in that side but he also bowled wrong line and length. So he struggled badly. David Hussey picked up wicket but not because he bowled good balls, he got the wicket because of the mistake from the batsmen. I think with this game Australian dominance in the World cricket is over and after 12 long years we will see new champion emerging. Its good for cricket. For Aussies and Ponting, it is a time of soul searching. Ponting era is also ended with this game and we will see change in Australian leadership in coming days. Sad end for the great captain and great batsmen who dominated the World Cricket for more than a decade. Kiwis face Proteas challenge at Mirpur. Kiwis will take on Proteas today at Mirpur in Dhaka. Its the fight for third semi-finalist spot. Kiwis have shown in the tournament that, if they play to their potential they can beat any team. I think Kiwis need little bit of luck also to go with their performance. They have class and talent in their batting but that batting has to click together if Kiwis wants to advance into the semis. Brendon McCullum, Guptill, Taylor are capable enough player to win the games on their own. Who can forget that league match against Pakistan in this World Cup where Ross Taylor alone ruined the Pakistani bowling and won the match for the New Zealand. Although they were lucky also in that match and that much luck is always on your side when you perform well. Kiwis beat Pakistan, Kenya, Canada and Zimbabwe during their journey towards quarter-finals. Kiwis won all these matches convincingly and none of the matches went to the wire. They lost to Australia and Sri Lanka but they beat the best team of their Group. So you cannot count Kiwis out of the contest today. They are bit handicapped because of captain Vettori's knee injury but they still have good bowling line-up and Tim Southee is their stand out bowler so far in the tournament. I think if Vettori play today and entire Kiwi team put collective effort then it will not be difficult for the Kiwis to beat Proteas.and seal the berth of semis. Talking about Proteas they are best side in the tournament alongwith Pakistan. They have quality 4 pacers and 3 quality spinners to choose from and they are the most balanced side among all the teams. Their batting line-up is excellent which consists players like Amla, Kallis, DeVilliers, Smith. Remember they are the best fielding side of the World Cup. Dale Steyn is No.1 bowler in ICC ranking and Hashim Amla is No.1 batsmen in the ICC ranking. They possess lethal spin bowling combination which will come good against the side like New Zealand which is not used to playing spin. Imran Tahir will be the key for South Africa. South Africa don't have many weakness except their mentality of choking under pressure which often hampered their progress in the big tournament. Amla, Kallis and DeVilliers are in good form and capable of taking on any bowling line-up in the World. They are also lucky in a sense that Australia is out of the tournament and they stands with very good chance of winning this World Cup, all they required is mental toughness under-pressure. If they will be able to do so then they will definitely emerge as winners.